Pete Seeger has died, and though one cannot say that his death at the age of 94 was untimely, it nevertheless has a sad connotation and he will be missed. He has written and performed many songs that influenced and shaped US culture, he has made his contribution and he will be remembered kindly. “If I had a Hammer,” “This Land Is Your Land,” “Where Have All The Flowers Gone,” “We Shall Overcome,” Midnight Special,” “Kisses Sweater Than Wine,” “Guantanamera,” “Turn! Turn! Turn!” are songs that he either cowrote or has made popular. Huddie Ledbetter, the black ex-convict better known as Lead Belly, and Woody Guthrie were Seegers influences and in turn he influenced Joan Baez, Bruce Springsteen, Dave Matthews, and many, many others. Political dissent had been a family tradition, A great-grandfather was a 19th-century abolitionist, World War I poet Alan Seeger, who wrote “I Have a Rendezvous With Death,” was an uncle, Seeger’s father was a conscientious objector during World War I.
Seeger had attended meetings of the Communist Party and was suspected to be as Communist Party sympathizer or even member. He was blacklisted by the US Government in the 1950s and subpoenaed in 1955 by the Congressional Un-American Activities Committee. Following a contentious hearing he was convicted of contempt of Congress and sentenced to one year in jail. The conviction was overturned in 1962 after a prolonged appeal process because of a technical flaw in the indictment. He was allowed on TV again in the late 1960s but had a protest song about the Vietnam War censored. Pete Seeger passed away only half a year after his wife Toshi, and this is a similarity to Johnny Cash, another iconic musician of the 20th century. Johnny Cash has written and performed many famous songs, among them “I Walk the Line”, “Folsom Prison Blues”, “Ring of Fire”, “Get Rhythm,” and “Man in Black.” He married June Carter, member of the famous Carter Family and a renowned artist in her own right, in 1968 and they were deeply in love throughout the 35 years of their marriage. 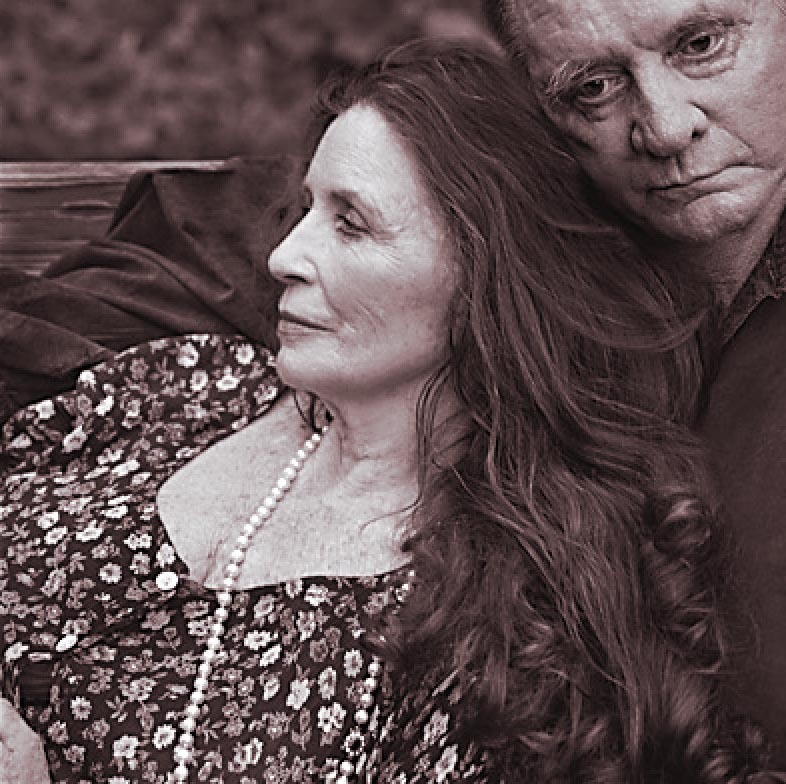 When June Carter died in May 2003, Johnny Cash was heartbroken and everybody around him realized that he didn’t want to live on without her. It was not unexpected when he died in September 2003, only four month after his wife. I watched a video, recorded during Carters short time as a widower, where he sits on the piano in his home and plays a song. His gestures and his mimic, the song, his voice, everything radiates such a fundamental sadness that it is hard not to be absorbed and devoured by it. 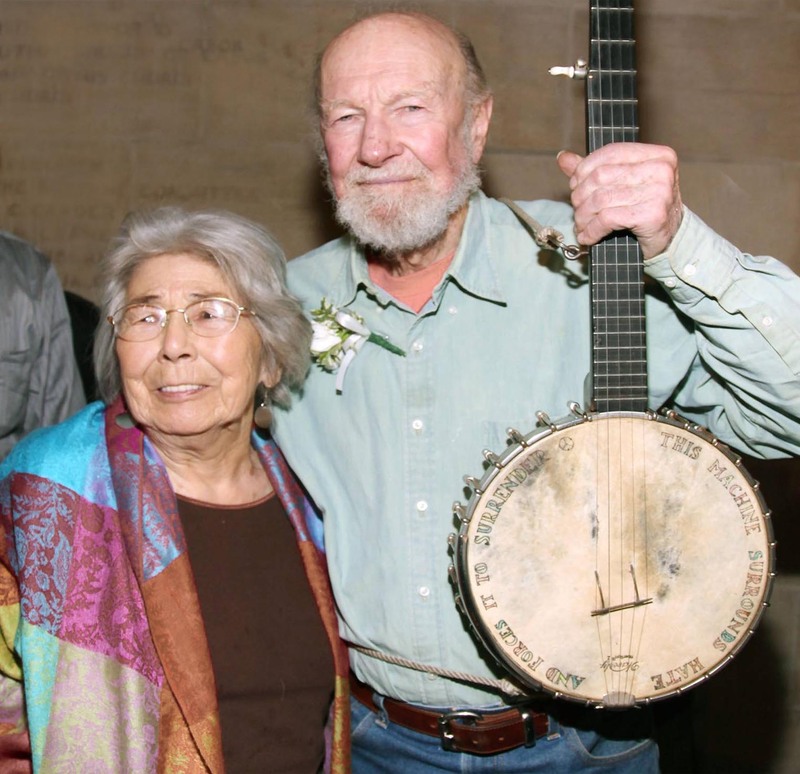 When I read in the post of a fellow blogger that Toshi Seeger, Pete Seeger’s wife for nearly 70 years and like he a successful artist, had died, I instantly thought of the pain, that this loss must have inflicted on him. I don’t know how he coped with the situation, it is a private matter after all, but his death only six month later is not surprising. In November a friend called me to tell, that his wife has died. They were married for 58 years. We have had many long conversations since then where he told me that his life is uprooted and the ceiling is falling on his head. 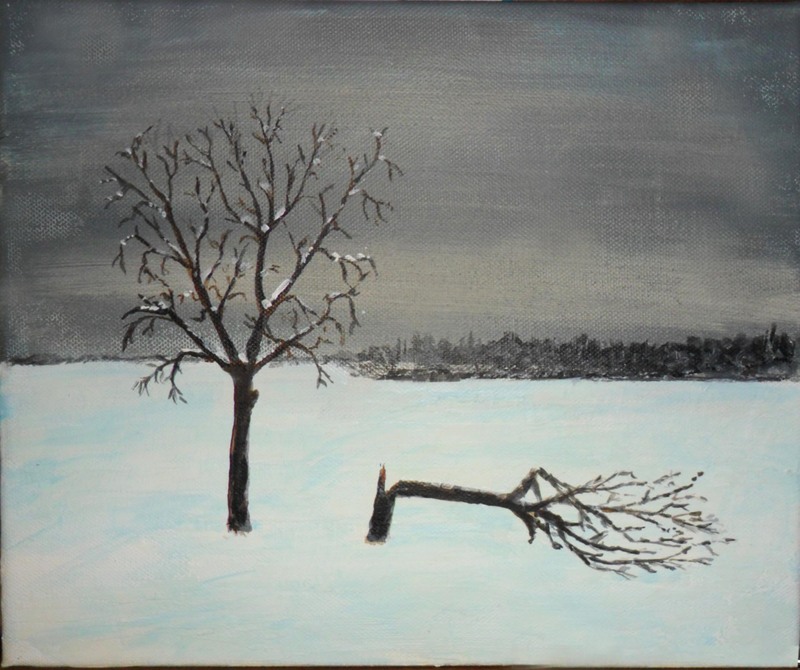 He showed me a picture where he had painted two trees on a snow field, one of them broken. When people live that long together, they have completely adapted to each other and their personalities have melted into one. They share their memories, their beliefs, their knowledge, and their skills. The challenges of life are faced and met together and everyone knows her/his place and her/his tasks. Which means in scientific terms, that the thinking, the inner working of the brain has changed and many memory patterns depend on and make only sense if combined with the memory patterns of the dear compagnon. When the mate dies, whole areas of the brain suddenly are obsolete. The most common practices, routines, habits, skills of daily life, which depended on her cooperation are useless now, big ares of the brain have to be reorganized and reconfigured for a new solitary life. This is the essence of loss. It is like a stroke and one has to start from scratch, to learn things new, to develop new routines, and completely reconstruct life. Many men in their later years are too burdened and tired to make this effort, they don’t want to go once again through the laborious and exhausting process, they rather follow their beloved wife into death. My friend though seems to have overcome the devastating loss and he seems to be determined to carry on. It would be a stretch to say that he is in good spirit, but he is already looking for someone new to share his life.